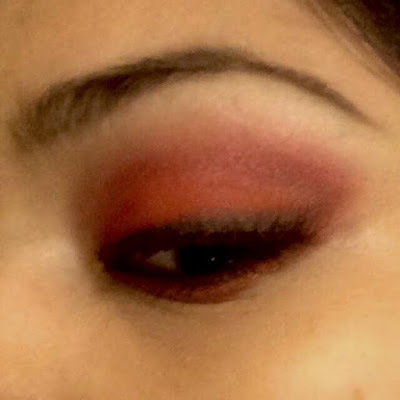 After lipsticks, eye shadows are my next other favorite makeup thing! I really consider eye makeup to be the highlight of every look. Today I’m going to review an eye shadow at this wonderful makeup and beauty blog. It is Coloressence Pearl Finish Eye Shades in Scarlet Red. Product Description: Indulged with Pearls and Special Pigments, Beautifies the Eyes with Pearl Shine Brilliance. Coloressence Pearl Finish Eye Shades gives pearly finish & satin smooth brilliance to the eye. Ingredients: Terminalia Belerica extract, Soyabean oil with Pearl finish effect. Directions to use: Can be use with brush directly in the eyes’ socket area or upper eyelid area or use with wet brush for long stay of color. It looks elegant enough & not cheap at all. It comes with a black outer box & it’s quite similar to the packing of M.A.C. Eye shadows. The only thing that differs is that the lid of this eye shadow is of screw type & can be detached from the product. The texture of this eye shadow is very soft & not powdery. It doesn’t feel chalky too. The term ‘Pearl finish’ is really apt for the product. Application also very smooth as the product blends in properly on the eyelids without giving any uneven areas. Talking about the shade, although its name is scarlet red, the color is bit pinkish or magenta. But I go no issues over that as I anyway don’t like the idea of red eyelids. The color pay off is really rich. One stroke is enough actually. 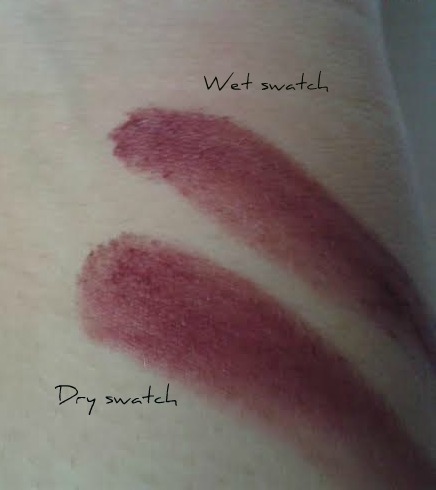 Also when applied wet the payoff is greater and doesn’t appear patchy. The staying power is really good. It stays for a really long time can stay for at least 6 hours. I had it on my eyelids for an entire day on my cousin’s wedding & it was still intact & I did not notice any fading or smudging. Also on being applied, it doesn’t get transferred on touching. Isn’t that an amazing thing? Thanks 😀 do try it out!